My daughter and I went to a local museum which celebrated Dia de los Muertos. We listened to a storyteller tell stories of her family heritage, of old folk tales, and the story of the altar she had set up. 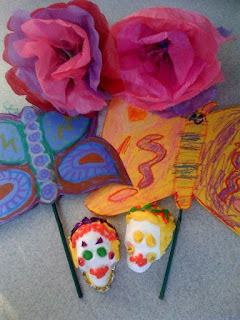 Then we made paper flowers, foil drawings, butterflies, and sugar skulls. There were musicians playing traditional music. We had a wonderful time.